You are here: Home>Sport>Other 3>Quoits International at Waunlwyd,Wales 104 pts Scotland 142 pts. Quoits International at Waunlwyd,Wales 104 pts Scotland 142 pts. Official Reception for the Wales and Scotland Quoits Teams at The Park Hotel,Waunlwyd. Civic Luncheon at The Park Hotel, Waunlwyd for WALES and SCOTLAND Quoits International Teams. Cwm Betterment Quoit Ground,Wales 223 pts v England 179 pts. 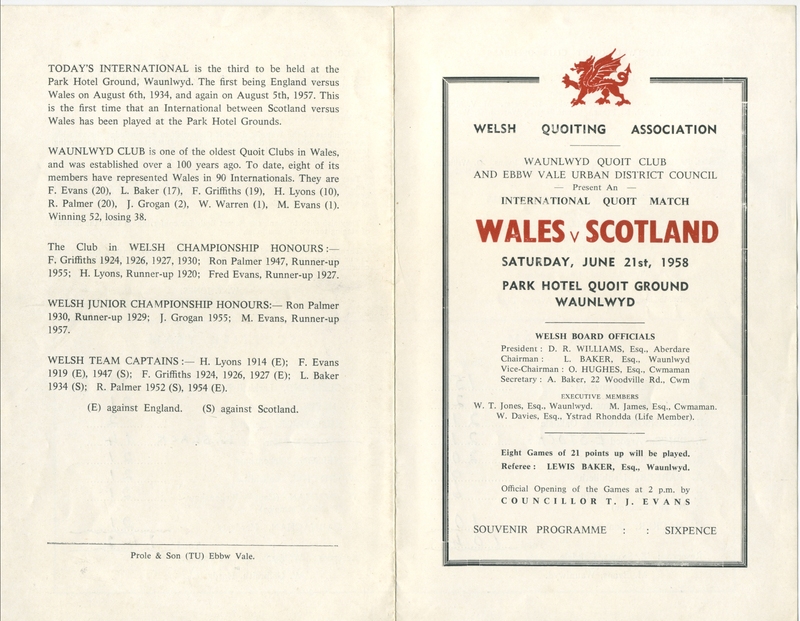 Fifty Years of Sport in Cwm 1896 to 1946 by Albert Baker. Quoits International at Cwm,WALES 223 pts ENGLAND 179 pts. 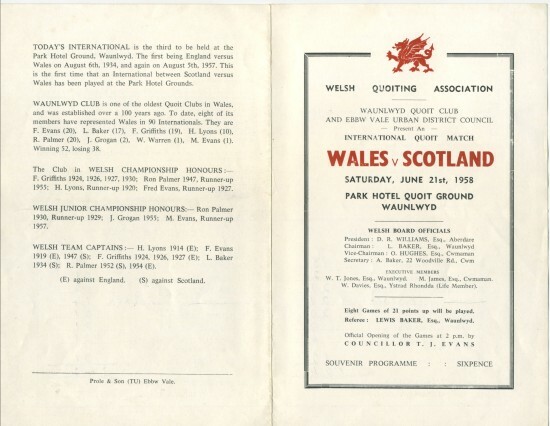 Quoits International at Llanhilleth 1954 Wales v Scotland. Quoits International at The Park Hotel ,Waunlwyd, WALES 149 pts England 86 pts. Quoits International at Victoria Park between Wales 237 pts and England 150 pts. Quoits International Wales 104 pts Scotland 142 pts.